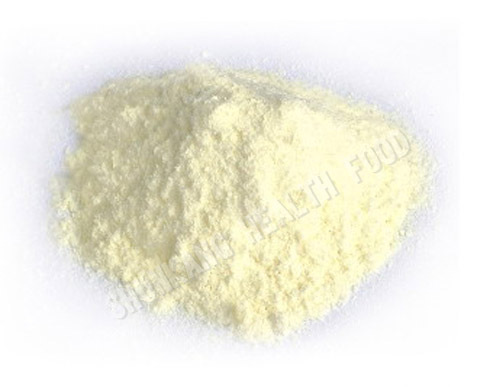 NINGBO SHUNKANG HEALTH FOOD,CO., LTD.
Lyophilized royal jelly powder is processed directly from fresh royal jelly,it is powder product which was named by vacuum freeze-drying machine,also was named royal jelly powder or lyophilized royal emperor jelly powder. Health effection:Prevent from cancer ,prolong life,protect liver,avail brain and mind,adjust blood pressure,strengthen haematogenous function,build up immunity ability,calm and make sleep peaceful,stimulate gonad,nourish nerve,hairdressing and nourish skin. Application:It was widely used in health tonic,health pharmacy,hairdressing and cosmetic area,and mainly was applied in capsule,troche and oral liquids etc. 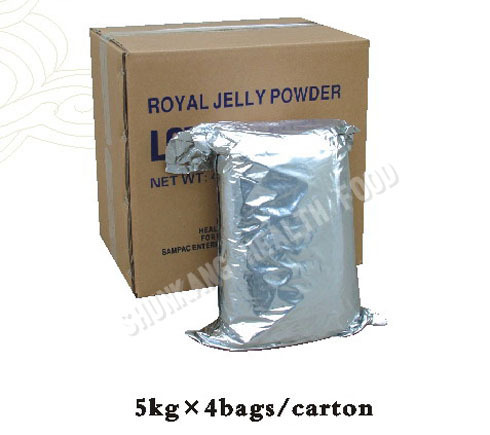 5kgs×4bags/carton, hermeticaly packed in double layer plastic& ALU-PE bag ,pasteboard cartons，carton size:38×28×37cm. we can packing according to client special package requirement.